Chronic pain is thought to involve the long-lasting strengthening of synapses, akin to what happens during the formation of new memories. This phenomenon, known as long-term potentiation (LTP), is triggered when neurons on both sides of a synapse are active at the same time. But now, Jürgen Sandkühler, Medical University of Vienna, Austria, and colleagues provide evidence that LTP in nociceptive circuits arises in a different way. By simultaneously activating two types of glial cells―astrocytes and microglia―the researchers were able to produce LTP at synapses that connect peripheral C-fibers and lamina I neurons in the dorsal horn spinal cord. They also showed that with high-frequency stimulation of C-fibers, glial cells strengthen active and inactive synapses through their release of the NMDA receptor co-agonist D-serine and the cytokine tumor necrosis factor (TNF). Moreover, these molecules traveled to distant synapses, perhaps explaining why pain hypersensitivity can develop in areas surrounding or far away from an injury. These results were published November 10 in Science. “We knew from previous studies that glial cells somehow contributed to the capacity of the nervous system to induce LTP,” said Sandkühler. For example, in 2013, he and his colleagues showed that glial cells in the spinal cord of rats are necessary for LTP at nociceptive synapses (Gruber-Schoffnegger et al., 2013). The researchers also knew that classical models of LTP, which posit that LTP only occurs at active synapses, don’t explain why pain hypersensitivity can spread beyond the site of an injury. So, they wondered, Can glial cells cause LTP at active, and inactive, synapses? To find out, co-first authors Mira Kronschläger, Ruth Drdla-Schutting, and colleagues first monitored neural activity in lumbar spinal cord sections taken from rats. They repetitively stimulated C-fibers that synapse onto dorsal horn neurons while recording excitatory postsynaptic currents (EPSCs) from lamina I neurons. Then, to selectively activate astrocytes, they uncaged the signaling molecule inositol trisphosphate (IP3) loaded inside the cells, thereby flooding them with calcium released from intracellular stores. This, however, led to long-term depression, but not LTP, suggesting that astrocytes alone were not sufficient for LTP. To test whether astrocytes and microglia were together sufficient for LTP, the researchers co-activated both cell types by applying BzATP—a chemical closely related to adenosine triphosphate (ATP), and an agonist of P2X7 receptors located on glial cells in the spinal cord. Again, this caused synaptic depression. Yet applying BzATP in the presence of DPCPX—an antagonist of adenosine’s A1 receptor—did trigger LTP. These findings likely reflect the fact that ATP is quickly converted to adenosine, which then acts on synapses through its A1 receptor. Therefore, it’s possible to trigger LTP if the two types of glial cells are activated concurrently and the A1 receptor is not engaged. High-frequency stimulation of neurons causes LTP at active synapses (so-called homosynaptic LTP), as well as at nearby but inactive synapses, onto the same neuron (heterosynaptic LTP). And, as Sandkühler has found, such stimulation activates astrocytes and microglia (Gruber-Schoffnegger et al., 2013). The researchers thus predicted that if both types of LTP are driven by glia rather than neurons, they should occur independently of each other. Indeed, when they stimulated C-fibers, they observed instances of heterosynaptic LTP at inactive synapses on five lamina I neurons without homosynaptic LTP at active synapses. The researchers went on to find that they could prevent all instances of LTP induced by high-frequency stimulation by blocking glial P2X7 receptors with the antagonist A-438079. Moreover, they could do the same by inhibiting the metabolism of glial cells, consistent with their past findings. How do glia communicate with C-fiber synapses? To answer that question, the investigators interfered with D-serine signaling using the degrading enzyme D-amino acid oxidase. That prevented LTP at active, and inactive, synapses following stimulation of C-fibers, as did blocking the NMDA receptors to which D-serine binds. These phenomena occurred in deeply anesthetized rats, too. The researchers showed that high-frequency stimulation of the sciatic nerve in these animals triggered LTP of C-fiber-evoked field potentials in the spinal cord, which again was prevented by blocking either glial metabolism or D-serine signaling. Yet blocking these after LTP arose had no effect, indicating that spinal glia trigger but do not maintain LTP. Finally, the researchers examined if molecules released by glia diffuse over long distances to induce LTP at distant sites. They first collected the superfusate (artificial cerebrospinal fluid perfused onto the spinal cord) one hour after high-frequency stimulation of C-fibers in deeply anesthetized rats. Then, they transferred the fluid to the spinal cord of naïve rats (no high-frequency stimulation). This triggered LTP in those animals, even when glial metabolism was blocked. Transferring superfusate from one cohort of naïve animals to another, however, had no effect. And, this “transferable LTP” was prevented by blocking D-serine, NMDA receptors, or the cytokine TNF, but not interleukin-1β. This suggests that D-serine, TNF, and perhaps other molecules travel to and strengthen more remote synapses. Unlike classical LTP, this new form of plasticity could explain why pain is often amplified near or far away from an injury (secondary and widespread hyperalgesia, respectively), or after patients halt their use of opioids (opioid-induced hyperalgesia). Still, several intriguing questions remain. For instance, “The experimental design is pretty beautiful,” Price said, but points out that the study only used male rats. There is increasing recognition, however, that what underlies chronic pain can differ significantly between males and females, especially when it comes to glial contributions (see PRF related news story). “I have serious questions whether they would see this LTP in females,” said Price. Another limitation is that the study did not test if blocking D-serine or TNF can relieve widespread pain hypersensitivity. 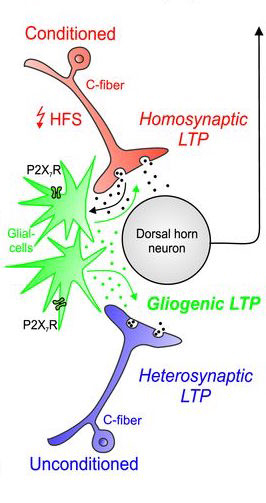 Gliogenic LTP spreads widely in nociceptive pathways. Science. 2016 Dec 02; 354(6316):1144-1148. Induction of Thermal Hyperalgesia and Synaptic Long-Term Potentiation in the Spinal Cord Lamina I by TNF-α and IL-1β is Mediated by Glial Cells.